In the last month of the war in 1918, a string of furious air combats took place over the countryside of northern France, involving the Australian Flying Corps’ No. 4 Squadron. By October 1918 it had been equipped with the latest fighting scout aircraft; the fast and agile Sopwith Snipe, successor to the better known but less capable Sopwith Camel. No. 4 Squadron had made a name for itself as a highly effective unit and it featured some of the AFC’s top aces. One who had carved a niche in just five short months as a courageous soldier, highly effective pilot and a respected leader, further distinguished himself in this period, but he was himself to fall just one week short of the Armistice. 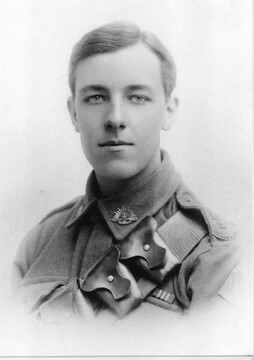 Thomas Charles Richmond Baker (1897-1918), was born on 2 May 1897 at Smithfield, South Australia. These days it is a northern suburb of Adelaide but in 1915 it was farming country. He was the eldest son of Mr Richmond Baker, schoolmaster and farmer, and his wife Mrs Annie Martha, née Gardner. He was educated from 1911 at the Collegiate School of St Peter, Adelaide (St Peter’s College), where he won the Farrell Scholarship. He was an accomplished sportsman featuring in rowing, tennis and football. Martha, née Gardner. On leaving school in 1914 he joined the Adelaide branch of the Bank of New South Wales as a clerk. His address on enlistment, in June 1915 was 113 South Terrace Adelaide. His mother, by then a widow, subsequently moved to 55 Park Terrace Unley. He embarked from Melbourne on 22 November 1915. Tom Baker went on to earn two Military Medals in quick succession as a Gunner in the 6th Field Artillery Brigade in late 1916. In September 1917 he embarked on a course of action to realise his dream of joining the aviators he saw daily above the trenches. He qualified as a pilot in June 1918 and in a spectacular but tragically brief combat flying career lasting five months, Thomas Baker's mark was immediate and profound. Between 23 June 1918 and 4th November (just one week short of the Armistice), he shot down a total of 12 enemy aircraft flying both the Sopwith Camel and its successor the Sopwith Snipe aircraft. Several of his victories were against the highly effective Fokker DVII biplane fighter. He was clearly in his element; often he closed extremely close to the enemy he was pursuing. But while life in the Flying Corps was exciting it was also very dangerous and on the 4th November, he and two colleagues were lost in air combat over the town of Ath against a 'gaggle' of Fokker DVIIs. Award of the Distinguished Flying Cross and promotion to captain were both posthumous. For such a young man he had displayed great qualities of leadership and personal courage. He was said to have had a forceful but pleasant personality, of his flying skill there was no doubt and he was a steady, respected flight-leader. It seems incredible that all this was accomplished by a young man of just 21 years of age at the time of his death. He was one of a legion of young men who were catapulted into the most extraordinary circumstances and whose lives were snuffed out well before time. 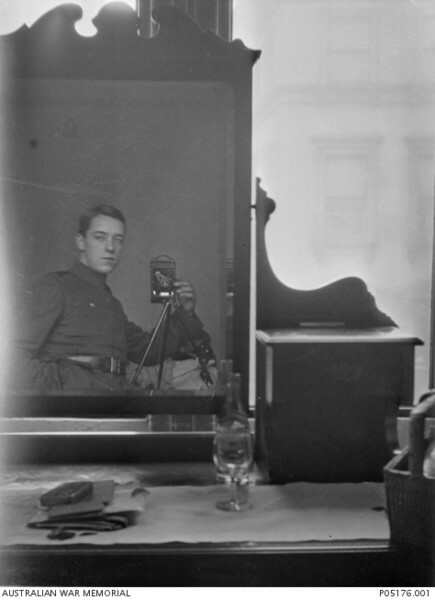 There is an intriguing photographic self-portrait, perhaps one of the earliest “selfies” on record, taken while he was undergoing flight training. It gives pause for reflection that some things have not changed as much as we might have thought in nearly 100 years; the intent persists but the technology has changed! A stained-glass window is dedicated to his memory at St John's Church of England, Halifax Street, Adelaide. If you are passing by, ask to have a look and reflect on the short life of this remarkable young man.